Visifold doors fold open effortlessly, gliding on stainless steel rollers allowing unrestricted thoroughfares and the maximum use of space and light. The signature smooth contours and curved clean lines create an attractive aesthetic that will compliment any home whatever taste or style. Aluminium bi-fold doors are among the cleverest and most convenient ways to make your home more special. They can help to open up interior spaces and turn them into areas that you and your visitors will find wonderfully welcoming and liveable. They’ll also help to make your home more attractive to buyers. When you’re looking for the perfect bi-fold doors South West England is where you’ll find the answer: Countryside Windows. A few decades ago, your choices for doors leading out of a conservatory or kitchen were limited. Conventional opening doors were simple, but of highly variable construction quality, and usually required large amounts of space to open into. Although this problem was avoided with sliding patio doors, these had the problem that their sliding mechanism restricted their opening area to half their overall width. Both these problems are overcome with bi-fold doors. Because they fold down to within a very short distance of the walls they adjoin, they provide much wider openings, which not only offer more space for users but also more flexibility in making your garden or patio a real part of your home. With the very high quality materials and workmanship we guarantee, you can also be sure of outstanding reliability and longevity. 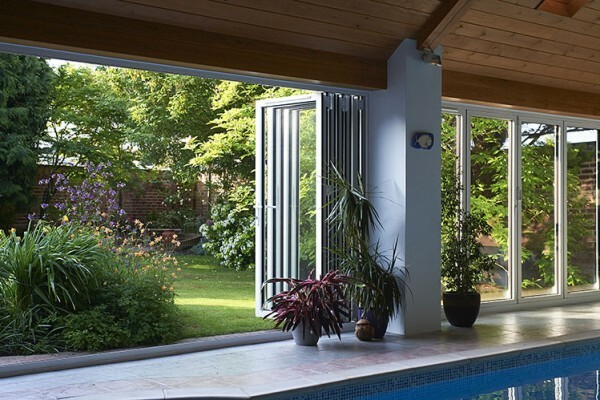 Aluminium is the ideal material for bi-fold doors. It allows a lightweight construction that enables these doors to be opened and closed effortlessly, time after time. Together with their beautifully fitted stainless steel rollers, you’ll always be able to have them just the way you want. Aluminium is also maintenance-free and resistant to rust damage, meaning that its clean, modern looks will last for years. With traditional doors, you’re generally confined to a few configurations. This is not the case with aluminium bi-fold doors, which can be configured to mesh perfectly with your needs and your home’s design. They can fold left or right, inwards or outwards, and even make use of corner spaces in a way impossible to achieve with traditional patio doors. You’ll find they give extra space and light to any home. Bi-fold doors will transform the way you think of summer entertaining. Because they run on tracks beautifully flush to the floor, it’s simple to make a conservatory or kitchen blend seamlessly with an exterior patio. All of a sudden, you’ve created a wonderfully spacious and airy space. Why be restricted to choosing house or garden for you or your guests to enjoy when you can so easily have both? Aluminium bi-fold doors are gaining in popularity with each passing year – and no wonder. They’re amazingly versatile, they look fabulous and they’re free of maintenance worries. No matter what type of home you have, add a whole new dimension with the finest doors South West England has to offer. If you’d like to find out how, get in touch today and discover just how good your home can look!